At George Hill Orchards, we believe in providing the freshest and best produce possible, directly to you. Now, more than ever, it is important to know how your fruit is produced. We no longer sell our fruit to commercial stores, resulting in a dramatic reduction of pesticide use. This means that you can trust our fruit to be among the healthiest available. Much of America's prosperity, innovation and values can be traced directly to agriculture. Unfortunately, the family farm is a way of life that has become foreign to most. Our goal is to give you a taste of that farm experience that is being lost in our fast-paced society. From our beginning in 1974, George Hill Orchards has been built from the ground up through the hard work and dedication of the Siver family. What once started as a small family operation including Don and Frieda Siver (Grammy and Poppy to all who know them) and their children, our farm family has extended over the years to include children, grandchildren, wonderful friends and of course, the many guests we look forward to serving every year! 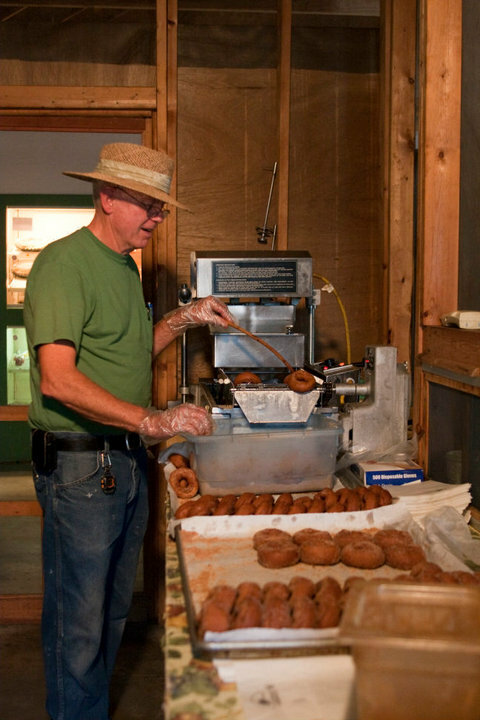 We're still proud to serve Poppy's famous cider donuts, Annette's home baked pies and goodies, and the delicious fresh fruit crops that Farmer Don tends to every year. Also amongst our family is a growing number of farm critters including many rescued animals cared for by Farmer Michelle. Although we can't all be at the farm every day, one thing is for sure - No matter who is present at the time of your visit, you'll be welcomed with a warm smile and treated like family.